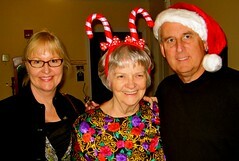 Friday night was the annual nursing home Christmas extravaganza. Sara, Jacob, Joey, Momo, her friend Brittany, Papa, Gigi & I all turned out to celebrate with Gmommy. The nursing home put out a yummy buffet of Southern holiday favorites: sweet potatoes with marshmallows, green been casserole, ham, turkey, pies, mac & cheese, the works. After dinner we were treated to some elder boogie. Mrs. Kelly (this cute little lady who is convinced she’s in Pennsylvania) and Gmommy were really getting down! 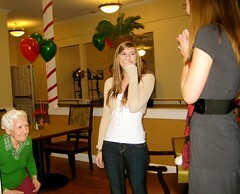 We had a great time and it’s so nice to see so much joy in an Alzheimer’s wing of a nursing home. Even the lady who normally complains and curses at people had a half smile on her face! More pics here. I have to admit that made me laugh (“the lady who normally complains and curses at people had a half smile on her face”) – is that wrong? LOL…!!! 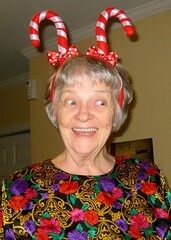 I am glad you all had a nice Christmas party and your grandmother is adorable! LOL! That’s a great picture of Grandmommy! !